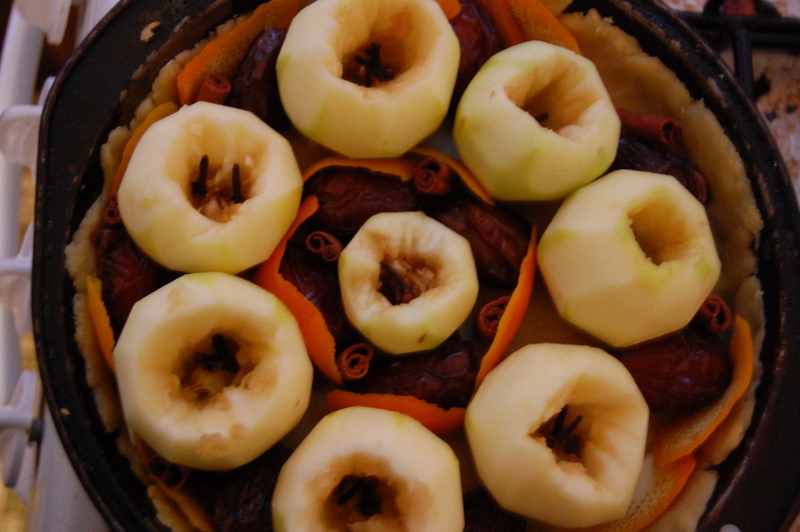 Today I’m going to be making Markham’s “A pippin pie.” Pippins are cooking apples, and I chose this recipe over Markham’s “codling tart” mostly because it has dates and oranges in it (the codling tart is apples and spices). Over the centuries, both sweet and savory pies have been made as a method of preservation. I know how to make a modern pie crust (where cold fat is cut into the flour), but pie crusts in Markham’s time were made much differently: the fat was cooked with water, then the hot mixture was added to the flour to form the dough. The crust from this time was called a coffin, and it was filled both with sweet fillings (like the pie I’m making) or savory fillings (mostly meat). There are some good sources online for these crusts, including a good breakdown of recipes for different types of pie crusts on Medieval Cookery (although the references are earlier than Markham, looking at how the pies were made in the previous centuries can give us a sense of how they evolved). The most useful discussion of coffins I’ve found online is Monica Gaudio’s post, (which for those who are curious is the same one involved in the current Cooks Source scandal, and serves as a gentle reminder to all of us to attribute online information to its author). Gaudio’s recipes are great because she shows a 14th century pie recipe, and a 16th century pie recipe, with some discussion of the recipes historically and how the two pies differ. Best of all, her recipes are really easy to follow, which will make it a really helpful resource for someone who’s never made a coffin before! Harold McGee also talks a bit about these pastries in his book, On Food and Cooking. He traces the roots of hot-water pastry to medieval times where it served as a container for meat dishes needing to be preserved for some time. It’s tender to eat, but retains cooking juices. It is made with a large amount of water (McGee says 50 parts water per 100 parts flour, along with 35 parts lard). The water and fat are heated to almost boiling, and the flour is stirred in just until it forms a mass, then the dough is rested. The large amount of fat limits gluten development which helps make for a tender crust, and repels water, keeping cooking juices from breaking down the crust. (McGee, 568). Take the fairest and best pippins, and pare them, and make a hole in the top of them; then prick in each hole a clove or two, then put them into the coffin, then break in whole sticks of cinnamon and slices of orange peels and dates, and on the top of every pippin a little piece of sweet butter: then fill the coffin, and cover the pippins over with sugar; then close up the pie, and bake it, as you bake pies of the like nature, and when it is baked anoint the lid over with store of sweet butter, and then strew sugar upon it a good thickness, and set it into the oven again for a little space, as whilst the meat is in dishing up, and then serve it. To speak then of the mixture and kneading of pastes, you shall understand that your rye paste be kneaded only with hot water and a little butter, or sweet seam and rye flour very finely sifted, and it would be made tough and stiff that it may stand well in the raising, for the coffin thereof must ever be very deep; your coarse wheat crust would be kneaded with hot water, or mutton broth and a good store of butter, and the paste made stiff and deep because that coffin must be deep also; your fine wheat crust must be kneaded with as much butter as water, and the paste made reasonable lithe and gentle, into which you must put three or four eggs or more according to the quantity you blend together, for they will give it a sufficient stiffening. The crust I’m making is the last one, and it’s a bit different from the recipe Gaudio wrote because Markham wants his readers to include eggs. Gaudio’s recipe is still helpful though for learning about technique. After another search, I found Margaret MacDuibhShithe/Gretchen Miller’s recipe (at the very bottom of the page) that includes eggs. Her recipe is actually a modernized version of Markham’s crust, so I am just going to follow her crust recipe rather than mess with figuring out proportions, and focus on the yummy filling. The center of the pie after being buttered and sprinkled with sugar. So, there were many things that went well with this recipe, and a few things I might do differently. First of all, Margaret’s crust recipe worked really well! All of the drawings of coffins I’ve seen from Markham’s times depict a pie with freestanding sides. I was worried about making a pie that way, so I put it in a 9 inch round pan in order to get the flat sides I’ve seen in pictures (rather than the angled, shorter sides of a pie pan). The crust may have been a bit too small for this, as I had trouble getting the edges to meet after I put the top crust on, but a little tugging got those edges in place eventually. Also, the footnote from Best suggested a 2 1/2 hour cooking time (taken from a contemporary source, not suggested by Best himself). I found the pie cooked to perfection in about an hour and 15 minutes. I also might use ground spices next time, although it is a deviation from the recipe, just so it makes the pie easier to eat. The pie was absolutely delicious! So flavorful and good smelling. I’ve never made a pie with dates in it before, but this one definitely makes me consider doing it again. 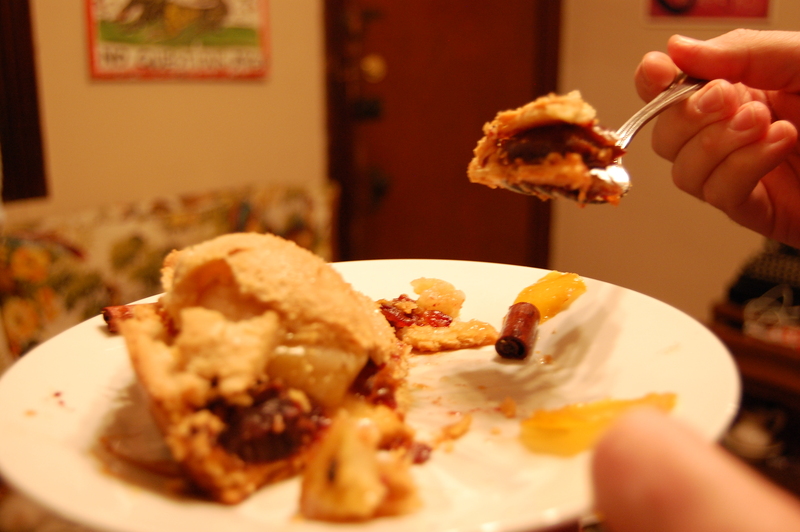 The crust tasted very similar to a modern pie crust, but a bit more dense. Enjoy! 2.Combine water and butter in a pan and simmer until butter melts. 3.Meanwhile, stir egg yolks into the flour until evenly distributed. 4.Make a well in the center, and pour the butter mixture in. Stir to combine, then knead until it forms a dough ball. 5. Divide the ball in half, and roll out to the size you need. 6. Grease the bottom and sides of a 9″ round pan, and put the bottom crust in, making sure it also covers the sides of the pan. 7. Using a paring knife, cut a hole in the top of each apple and remove the seeds, and put two cloves in each apple. Arrange in the crust. 8. 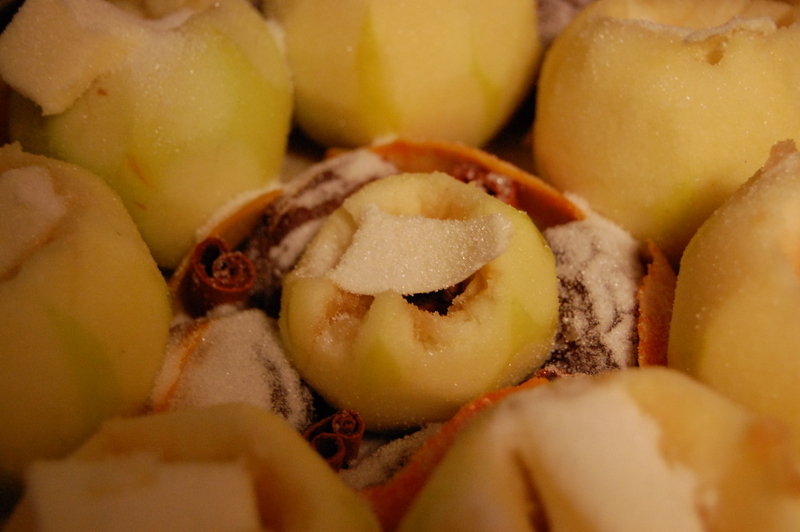 Arrange the dates in the open spaces around the apples, then evenly distribute the orange peels and cinnamon sticks. 9. Place a small pat of butter on top of each apple, and sprinkle the entire filling with 1/2 cup sugar. 10. Roll out the top crust, and place on top of the pie. 11. Bake at 350 for 75 minutes, or until the apples are tender and the crust is just golden brown. 12. Brush the crust with melted butter and sprinkle with sugar, then continue baking for 10-15 minutes. A slice of the finished pie!